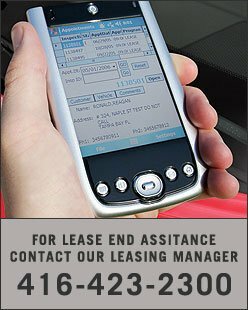 For lease end assistance, please contact our Leasing Manager at (416) 423-2300. Certified Used Vehicle (CUV) programs offer significant advantages over used vehicles that are not certified. The decision to buy a certified used vehicle is clear – new vehicle benefits at a used vehicle price. With a solid reputation for reliability, performance, safety and value, a Honda Certified Used Vehicle is truly a great opportunity. With a Honda Certified Used Vehicle, you’ll also have access to financing options through Honda Financial Services. Buying your leased Honda is a great way to continue benefiting from its reliability, performance, and high resale value. However, before you decide to buy your vehicle, we suggest that you have it inspected. The free inspection may provide some value added information that could impact on your decision to buy. To find out your purchase amount, you can get a payoff quote 24 hours a day, 7 days a week through our Owner’s Website (www.myhonda.ca) in the My Finance section. Or you can simply call our Leasing Manager for assistance. Be sure to ask us for a Honda Financial Services loan to help purchase the vehicle.